Call hotel at 1-760-322-6000 and request pick-up. The easiest and most cost effective public transportation option to get to Palm Springs from LAX will be taking a FlyAway Bus from LAX to Union Station in Downtown LA (every 30 minutes) and then a FlixBus to Palm Springs Downtown. The total cost per person each way is about $20. The Palm Springs Convention Center offers an excellent venue and ambiance in line with our interest of providing the best conference experience possible. The exhibits and posters will be situated in Oasis 3-4 in the Convention Center. 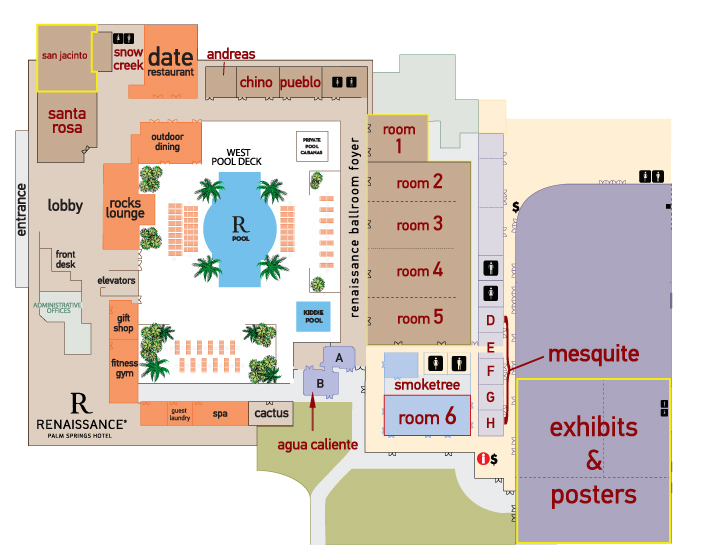 The Scientific Sessions will be held in Renaissance Hotel California Grand Ballroom breakouts (Catalina, Madera, Pasdena, Sierra/Venture) and the Mojave Learning Center. Additionally, Scientific Sessions may be held in Smoketree, which is part of the Convention Center, but located just next tot he California Grande Ballroom. Short Courses will be held in the California Grand Ballroom breakouts, Smoketree, Mojave Learning Center, Chino, Pueblo and Andreas. MSACL offices for the conference will be located in Smoketree F and Agua Calienta Board Rooms.